I mean it’s all fine having a website that informs people about what your business is about, but unless people are finding the site, then you may as well put a poster on a lamppost and hope for the best. So I’ve decided I’m going to just write a post which outlines what work you might like to get me involved with. There’s wide ranging stuff here, so let’s get to it. Unsurprisingly a main tenet of the work I want to be involved with is in the development of L&D / OD strategy for companies. There is a lot of debate and talk about various aspects of learning, development, technology, systems, engagement strategies, and all that comes with those debates. I can help bring insight to those discussions and facilitate sessions on the same. My experience in L&D informs me that there are a few things which are important to always bear in mind. What is the need that is being addressed? How does it fit into business objectives? Is there internal knowledge and expertise which can address the problem? How can a solution be developed that addresses the need? This approach means that I am less attached to models and theories and more interested in developing highly relevant and content rich L&D solutions. My approach to OD is to understand what the organisational issue is and co-create a solution. I don’t believe I have the answers to all problems, and I do believe that together we can develop a solution which is business relevant and uses modern insights. In developing OD solutions I look at the systems, the culture, the leaders and the people to understand how the problem is manifest and gaining insight into what could work and what is needed to support development of a solution. I’ve developed a workshop that helps address the dire need for skills development for L&D leaders and for practitioners. There are many modern learning theories and models which are valuable to the profession but little support in how to deliver using those theories and models. The ‘Leaders’ workshop helps address how to develop a performance consultancy mindset, understanding current trends in user experience and impact on learning solution design, and a facilitated fishbowl forum for debate with peers. The ‘Practitioners’ workshop is over two days and deals with developing understanding of facilitation techniques such as World Cafe and Open Space, how to develop communities of practice, developing skills for digital learning solutions including content curation and using digital tools in learning delivery. I’m big on drawing insights from various other disciplines to inform what L&D does better. I’ve given talks on this and write a lot about what this looks like and how to take advantage of it. I think there’s a lot we miss in L&D and enjoy testing and challenging the thinking of leaders and practitioners. I’m well studied in the field of positive psychology. It’s a topic which people find fascinating to learn about and how it can help them improve their wellbeing. It’s an energising topic which really helps people understand what actions they can do themselves and what support they require for improved positive living. I’ve also delivered workshops on how we can use learnings from positive psychology to develop skills of leaders and managers with a focus on strengths, building personal and team resilience, creating an appreciative working environment and language development. This is a marked difference to typical leadership and management skills development. Kind of what it says on the tin. Let’s do this. Take everything I’ve described about Positive Psychology workshops and I’m well versed in the same about Emotional Intelligence. The insights we’ve had about EI in recent years are leaps and bounds ahead of what we knew about the topic 10 years ago. There’s so much to be able to truly understand that I believe its impact hasn’t been fully understood yet. See, the thing is with subjects like these is that no one really knows what to do with them. 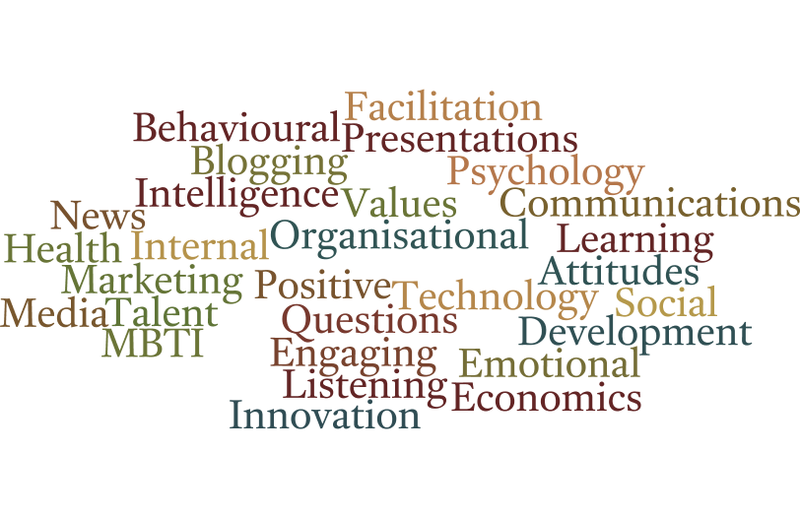 We all understand they are important subjects, but how do we talk about them well in learning and organisational development initiatives? How does this stuff make a difference at work? How do we provide development, resources and information so that people gain access and develop their capability with these topics? Good questions, right? Let’s talk about that. I am a big fan of the unconference format. It allows for people to truly self-direct and determine what they want to debate, how they debate it, and what action they choose to take from it. It means creating an environment of trust and sharing where people feel their voice is valid and their opinion can be heard without repurcussion. Sound like something you want to explore? It’s not as hard as it sounds to make happen. I design solutions which embrace diversity and are actively inclusive. I actively use technology to help me deliver the work I do. I believe in the strength of individuals and teams to deliver what they can. Where appropriate, I will challenge poor behaviour with respect and with dignity. I welcome feedback on your experience of working with me. Together, we can always create an amazing solution so long as both parties are willing. I actively encourage open sharing, transparency of thinking and thoughtful dialogue. I will always honour private discussions and only share when given permission. I openly share and discuss my work through social media. What does positive psychology tell us about leadership? My Curriculum Development work at Furman has led me to explore L&D/OD (Learning & Development/Organizational Development) recently, since I believe this is an overarching solution where my current efforts fit in as a modest part. Sukh Pabial is an occupational psychologist and 13-year veteran of L&D who has worked in retail broadcasting, digital marketing, and other positions in the United Kingdom. The blog I’m sharing here is one from his own L&D company—it’s a great place to find posts about unconscious bias, ways to approach the narrative surrounding digital learning tools’ usefulness, and more. A thorough and engaging blog in L&D/OD that I would suggest YOU read!